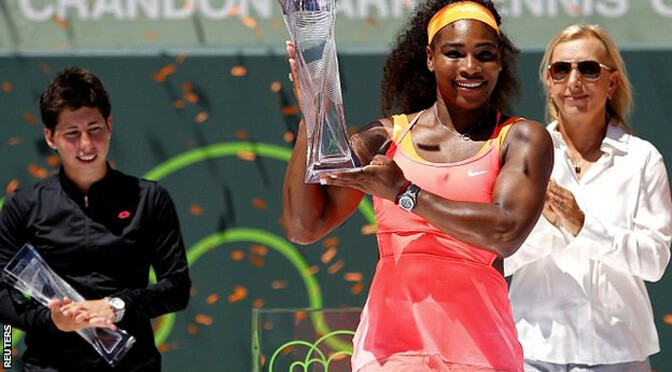 World number one Serena Williams thrashed Spain’s Carla Suarez Navarro to win her eighth Miami Open title. The 33-year-old raced to a 6-2 6-0 victory in 56 minutes to secure her third straight title at Crandon Park. The American won the final 10 games as she outclassed Suarez Navarro, who will make her top-10 debut next week. Suarez Navarro, 26, went into the biggest final of her career having won just 10 games in four previous meetings with the younger Williams sister, and the 12th seed could add only two more. 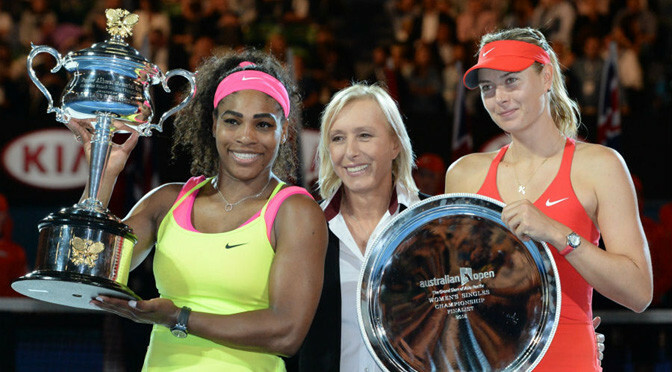 Serena Williams continued her dominance over Maria Sharapova as she collected her 19th grand slam title with a straight sets victory in the Australian Open final. Sharapova has not beaten her rival for 11 years and her losing streak continued at Melbourne Park on Saturday, as the American enjoyed a 6-3 7-6(5) victory on Rod Laver Arena to claim the championship for a sixth time. Top seed Williams, who was suffering from a coughing fit, broke Sharapova in the opening game of the match and she rallied to take the first set, amid a short rain delay, in 47 minutes. Sharapova offered stubborn resistance in the second but, despite saving two championship points and forcing the tie-break, Williams proved too strong and wrapped up victory just shy of two hours. “Growing up I wasn’t the richest but I had a rich family in spirit and support,” Williams said afterwards. “Standing here with 19 championships is something I never thought would happen. “I went on the court with just a ball, a racket and a hope and that’s all I had. It’s inspiring for you guys that want to be the best you can be, you never give up because you never know what can happen and who you can inspire and influence. She added via Channel 7: “I had a really bad cough and ended up throwing up actually. I think that helped when I got everything out of me and cleared my chest out because I couldn’t breathe a little bit. “I’ve had a really bad cold and cough. Usually when that happens you stay in bed for a week, you don’t play matches every other day and practice every other day. Now I have a couple of days to take a deep breath and lay down. Despite having not beaten her opponent since 2004 – a run of 16 straight losses – Sharapova was again magnanimous in defeat. She said: “I have to congratulate Serena on creating history and playing some of her best tennis. It’s an honour playing against her. I’ve not beaten her in a really long time but I love stepping on the court every time because she has been the best and you always want to play the best. Victory sees Williams move into outright second in the list of grand slam titles won throughout the Open era; lifting the Daphne Akhurst trophy again saw Williams climb above Chris Evert and Martina Navratilova. She is now three titles away from Steffi Graff’s record of 22. Serena Williams will face Maria Sharapova in the Australian Open final after the pair won their semi-finals in straight sets in Melbourne. World number two Sharapova won an all-Russian contest against Ekaterina Makarova 6-3 6-2. Williams, the top seed, converted her ninth match point to beat fellow American Madison Keys 7-6 (7-5) 6-2. Williams, 33, capped a fine performance with a dramatic ending as she saw seven match points slip by at 5-1, before converting her ninth with an ace and a scream in the following game. Keys, 19, matched Williams for power but not always control as the 18-time Grand Slam champion edged a tight match over one hour and 24 minutes. The world number one, a five-time champion in Australia, recovered from 3-0 down to force a tie-break and clinched it with a big serve. A fired-up Williams bounced up and down in delight at the baseline, and powered on with a break at the start of the second as she began to dominate the Keys second serve. Williams flipped a brilliant forehand winner around the net post on her way to breaking again at 4-1 and eventually closed out after that gripping seventh game. Sharapova, the 2008 champion, had earlier needed one hour and 27 minutes to beat 10th seed Makarova for the sixth time in six meetings. The 27-year-old coped well on serve after saving two break points in a testing 10-minute opening service game, easing into a 4-1 lead. Makarova, 26, hinted at a comeback when she broke for 4-3 but Sharapova responded immediately and served out the set after 48 minutes. When she hammered away a backhand for the double break at 3-0 in the second, there was no way back for Makarova. Sharapova made it six games in a row, saving two more break points at 4-1, to seal a place in her 10th Grand Slam final. The Russian has a 2-16 record against Williams and has not beaten the American since 2004. Madison Keys beat Venus Williams to reach her first Grand Slam semi-final and end the possibility of an all-Williams contest at the Australian Open in Melbourne. The unseeded 19-year-old came through 6-3 4-6 6-4 in one hour and 54 minutes. The American goes on to face top seed Serena Williams, who swept past 11th seed Dominika Cibulkova 6-2 6-2. Keys overcame a recurrence of the upper leg injury that hampered her at Wimbledon last year, requiring a medical timeout off court during the second set. “It was definitely kind of a flashback to Wimbledon for me,” she said. “I have had some problems with that part of my leg, so it was kind of an overwhelming moment. 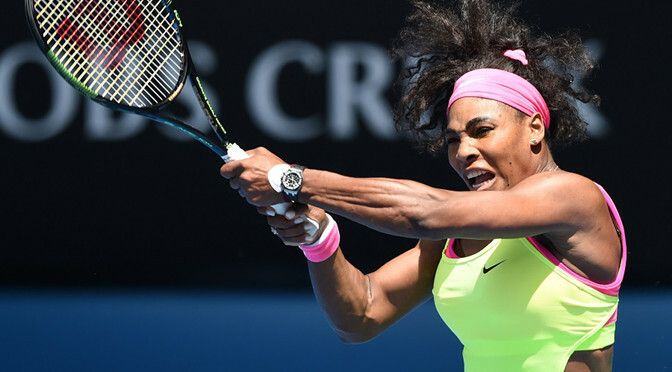 Serena Williams fired down 15 aces in a comprehensive 65-minute win over last year’s finalist Cibulkova. The 33-year-old American has won the title on all five occasions she has made it past the quarter-finals. World No.1 Serena Williams avenged her heaviest grand slam defeat with a 2-6 6-3 6-2 comeback win over Garbine Muguruza to reach the Australian Open quarter-finals. She will be joined there by her older sister, as Venus Williams continued her resurgence with a 6-3 2-6 6-1 win over sixth-seed Agnieszka Radwanska to reach the last eight of a slam for the first time since the 2010 US Open. It is the first time the siblings have both reached the last eight at a major since Wimbledon that year. Serena was pushed all the way by 24th-seed Muguruza, who matched her in the heavy-hitting rallies, and who had conceded only four games to her in a second-round upset last year at the French Open. The five-time Australian Open winner next faces Dominika Cibulkova, who reproduced the kind of tennis that helped her reach the final here last year as she beat two-time champion Victoria Azarenka 6-2 3-6 6-3. Serena appeared to be laboring at times, and had a serious cough. She struggled with her serve in the first set, winning only one of a dozen points on her second serve as the 21-year-old Spaniard went on the attack. She couldn’t convert her six break-point chances, while Muguruza broke her twice. 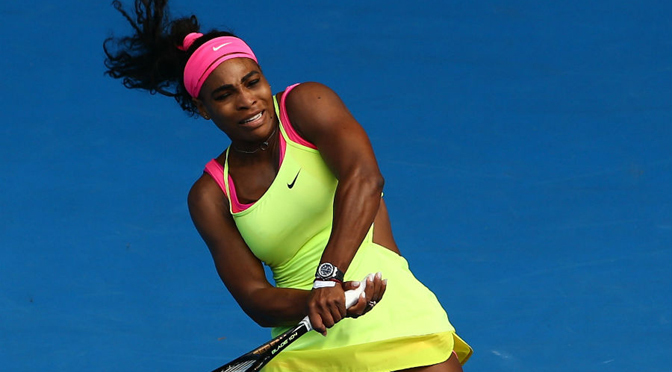 She hasn’t advanced past the quarter-finals at Melbourne Park since winning her last title here in 2010. There was a lot to distract her. In the first set, six planes were doing coordinated loops and tricks in the sky over Rod Laver Arena, as part of the Australia Day celebrations in downtown Melbourne. She had difficulty breathing at times, and had a heaving coughing fit into a towel at a changeover. She gradually picked up power in the second set, broke for a 5-3 lead and then fired three aces and a service winner to level the match at 1-1, screaming as she pumped her fist. After missing break points on Muguruza’s serve in the opening game of the third, Williams saved six break points and needed almost 13 minutes to hold. Her confidence up, Williams broke for a 3-2 lead and dominated the rest of the match. Serena Williams saw that older sister Venus was progressing to the fourth round at a grand slam tournament for the first time since 2011 and it inspired her own comeback win Saturday at the Australian Open. Top seed Serena Williams made a lacklustre start to her third-round match against No.26-ranked Elina Svitolina on Rod Laver Arena – knowing when she walked out that Venus was down a set and a break on a nearby court – but picked up her game after realising her sister had recovered and was advancing with a 4-6 7-6(3) 6-1 win over Camila Giorgi. She’ll have to be at the top of her game in the next round, where she’ll meet No.24 Garbine Muguruza, who beat her in the second round at the French Open last year. Muguruza defeated Timea Bacsinszky 6-3 4-6 6-0. Venus Williams couldn’t contain her delight after her win on Margaret Court Arena, beaming a smile as she turned to wave to all sides of the stadium and then moved to the music blaring over the loudspeakers. 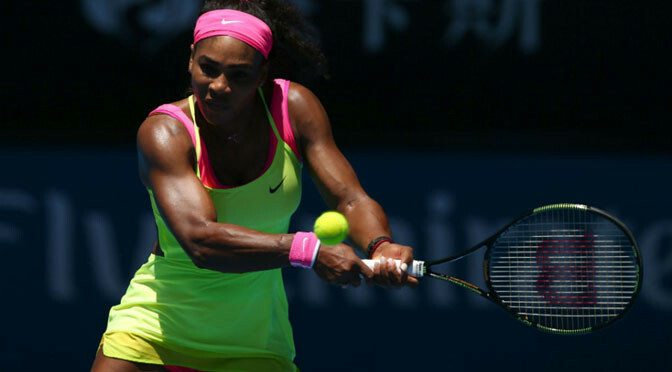 She said the sibling relationship, and rivalry, helped both of the Williams sisters. “I’ve been motivated by Serena, though, since day one, since ’97. She’s always been I think someone that anyone can learn from. The way she faces her life, the way she is fearless on the court,” Venus Williams said. Seven-time major winner Venus next faces sixth-seeded Agnieszka Radwanska, a semi-finalist here last year and Wimbledon finalist in 2012, who advanced with a 6-0 7-5 win over Varvara Lepchenko. In an all-American third-rounder, Madison Brengle beat Coco Vandeweghe 6-3 6-2. Venus Williams was diagnosed with an auto-immune condition called Sjogren’s syndrome in 2011, which can cause joint pain and saps energy. In the 13 Grand Slam tournaments after her fourth-round appearance at Wimbledon that year, she skipped two and made first-round exits in four others, including the 2014 Australian Open. She was only two points from a third-round departure in the second set against Giorgi, serving at 30-30 in the ninth game, before working her way back into the contest. Giorgi also had a chance to serve for the match but couldn’t hold. 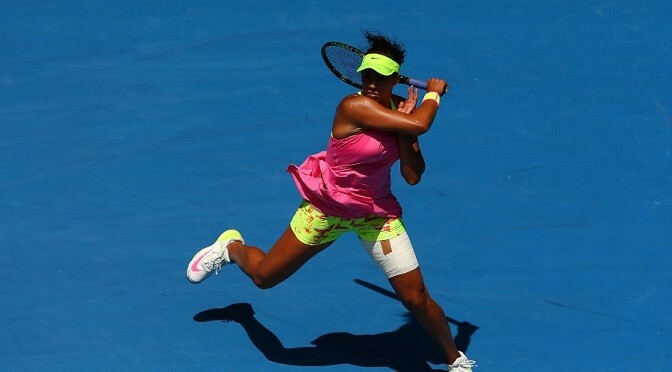 The Italian player contributed to her own demise with 16 double faults. “Well, this old cat has a few tricks left,” Venus Williams said in her on-court interview “It feels fantastic especially when things happen in your life and it’s not in your control, so it definitely feels awesome to be here, and I don’t want to leave it at that. Unseeded Victoria Azarenka continued her good form with a 6-4 6-4 triumph against Barbora Zahlavova Strycova. Elsewhere, Dominika Cibulkova saw off Alize Cornet 7-5 6-2 while Madison Brengle beat Coco Wandeveghe 6-3 6-2. 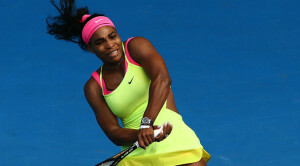 Serena Williams reached the third round of the Australian Open with a straight-sets win over Russia’s Vera Zvonareva. Men’s top seed Novak Djokovic thrashed Andrey Kuznetsov 6-0 6-1 6-4 and defending champion Stan Wawrinka beat Marius Copil 7-6 (7-4) 7-6 (7-4) 6-3. “I just remember what a tough match [it was],” Venus said. “It was just relentless. I think it finally ended with a break in the third. That’s all I can remember. Heather Watson was back on court – the same court – 48 hours after losing in the singles, and requiring treatment from the doctor. 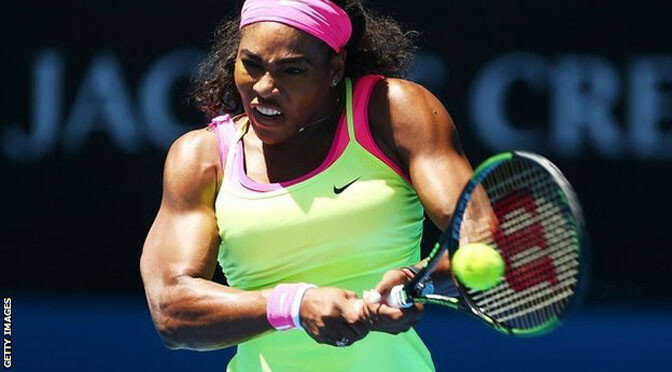 World number one Serena Williams overcame a second-set wobble to beat Belgian Alison van Uytvanck 6-0 6-4 in the Australian Open first round. The five-time champion, who has not been past the last eight since 2010, breezed through the first set, but was put under pressure before prevailing. Four-time winner Novak Djokovic beat Slovenia’s Aljaz Bedene 6-3 6-2 6-4 in the men’s competition. Defending champion Stan Wawrinka saw off Turkey’s Marsel Ilhan 6-1 6-4 6-2. 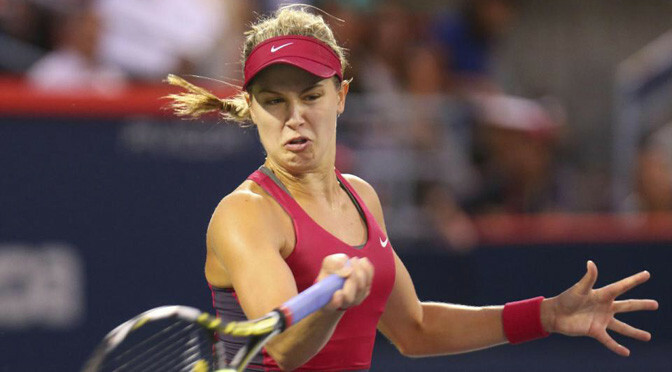 Canadian teenager Eugenie Bouchard swatted aside an out-of-sorts Serena Williams 6-2 6-1 at the Hopman Cup in Perth. The American world number one’s body language throughout the contest suggested she would rather have been anywhere else than on the blue hardcourts in Western Australia. An on-court espresso helped spark her into life as she overcame a first set bagel to beat Italy’s Flavia Pennetta 0-6 6-3 6-0 on Monday in the round robin mixed team event but nothing could help bring her out of Tuesday’s malaise. Sluggish footwork and uncharacteristically slow serves allowed Bouchard to break the 33-year-old with ease as the Canadian bounced back from a 6-0 6-4 thrashing by Czech Lucie Safarova in her opener. Williams had complained of jet-lag following her previous day’s efforts against Pennetta but she looked in good spirits as she teamed up with John Isner to win their mixed doubles against the Italians for a 3-0 whitewash later on Monday evening. Williams, who did not call the trainer to court on Tuesday, showed flashes of her usual brilliance against Bouchard as she went for her shots but never had the consistency, or the fight, to beat the Canadian. Whether it was jet-lag, illness or something else, Bouchard did not care as she notched a first win over the 18-times grand slam singles champion in the warm-up event for the year’s first major, the Australian Open, later this month in Melbourne. “I think I played pretty solid, I’m happy I came out and put on a better show than last time, the 19-year-old world number six said in a courtside interview.